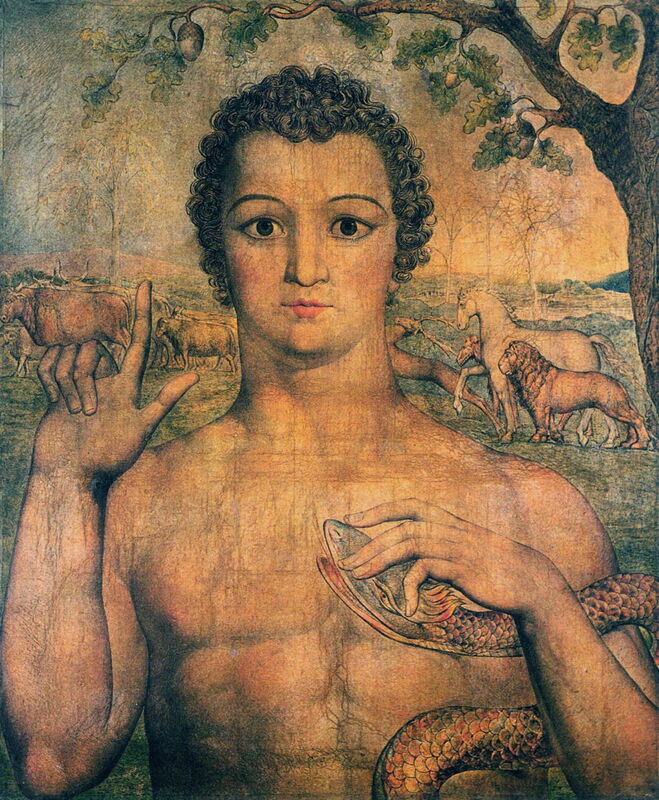 William Blake (1757–1827), Adam Naming the Beasts (1810), pen and tempera on canvas, 75 x 62.2 cm, Pollok House, Glasgow, Scotland. The Athenaeum. 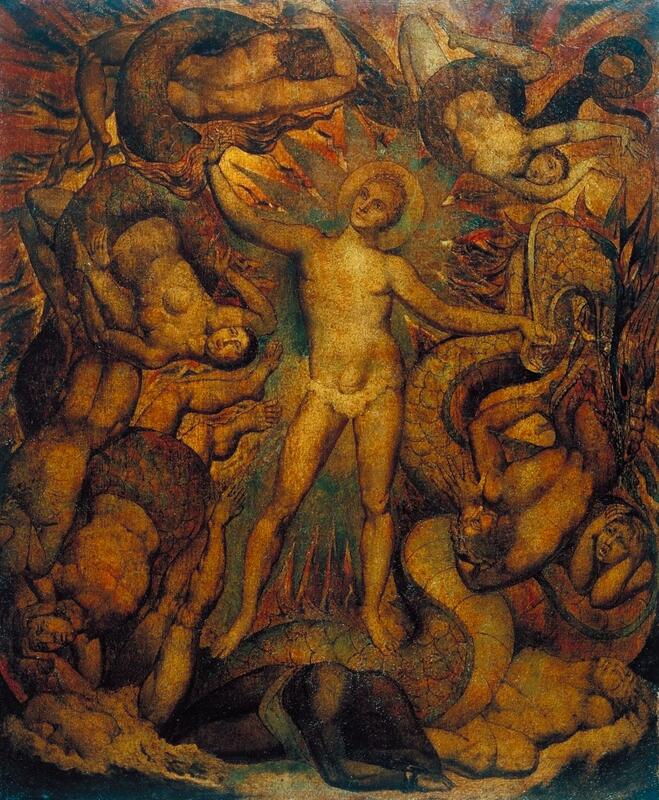 After 1800, William Blake continued to paint a limited number of works using glue tempera, although the great majority of his paintings remained in watercolour. The media and techniques overlap to an extent, and some of his last tempera paintings appear intermediate. In essence, though, his watercolours were made with water-based paints and a vegetable gum binder on paper, whilst his glue tempera paintings were made with water-based paints and an animal glue binder on a chalk ground. This article shows a selection of those later tempera paintings, and follows on from the last on his Bible paintings of 1799-1800. Blake painted three works in which he set famous contemporary figures: Admiral Lord Nelson, Prime Minister William Pitt, and Emperor Napoleon. The first two were shown in a private solo exhibition which he staged in his brother’s house in 1809. That of Napoleon was not shown there, and has subsequently been lost. The Spiritual Form of Nelson Guiding Leviathan (c 1805–9) shows, at its centre, the figure of the great British Naval commander, accorded a halo of reverence for his achievements. With his arms, he is directing Leviathan, the biblical sea monster which here symbolises (maritime) warfare, and whose coils are wrapped round men and women victims. Nelson had only died in 1805, and was buried as a hero of the nation the following year. Although Blake is careful not to offend his memory, he uses Nelson to express the horror of war. The Spiritual Form of Pitt Guiding Behemoth (c 1805) shows William Pitt the Younger as if he was a Buddha in an Asian painting, but directing the “storms of war” in the form of the huge beast, the biblical Behemoth, which is under him. Pitt and the beast are surrounded by apocalyptic images of war, strife, and suffering, again expressing Blake’s horror of war. Pitt had been the Prime Minister of Britain during the war against France, and died in 1806. Blake’s use of Buddhist symbolism here is particularly unusual; it was more than fifty years before such symbols entered mainstream European painting, and even then they were considered exotic. Suitable source material was held by the British Museum and other collections at the time, but I don’t think that Blake had ever engraved from Asian artworks. William Blake (1757–1827), Sir Jeffery Chaucer and the Nine and Twenty Pilgrims on their Journey to Canterbury (1808), pen and tempera on canvas, 46.7 x 137 cm, Pollok House, Glasgow, Scotland. The Athenaeum. Sir Jeffery Chaucer and the Nine and Twenty Pilgrims on their Journey to Canterbury (1808) is a large and very detailed panorama of Chaucer and the Canterbury pilgrims who made up his Canterbury Tales. Blake’s catalogue for the 1809 exhibition gives a detailed account of the main characters included. The Bard, from Gray (c 1809) refers to Thomas Gray’s poem of the same name, which tells how King Edward the First condemned to death all the bards in Wales, after he had invaded that country. A lone survivor confronted the king, and delivered to him a prophecy of doom. Blake shows the king and his Queen Eleanor with their horses, at the foot of the pinnacle on which that sole surviving bard stands to deliver his prophecy. Blake viewed the Celtic bards as being his antecedents. 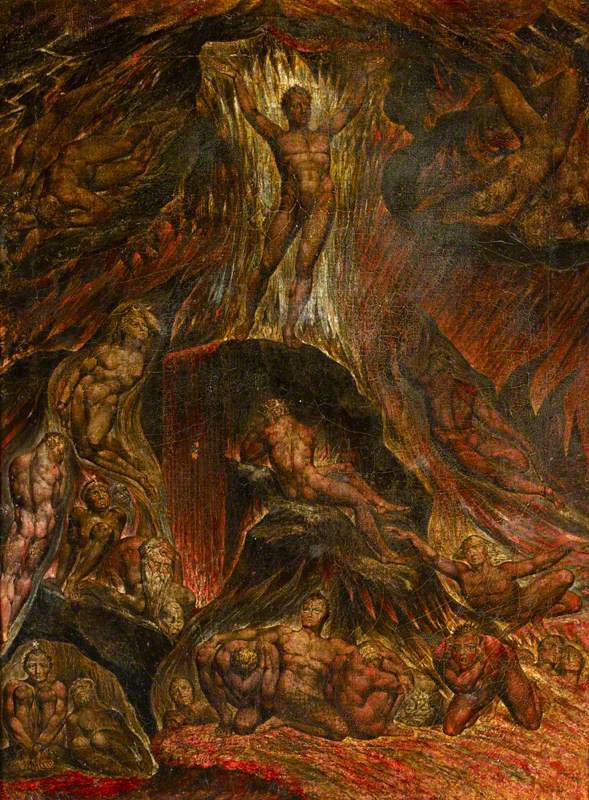 These two paintings show a scene from Milton’s Paradise Lost, Book 1, lines 300-334, in which Satan organises the other rebel angels in Hell (or Tartarus), aided by Mammon and Beelzebub. 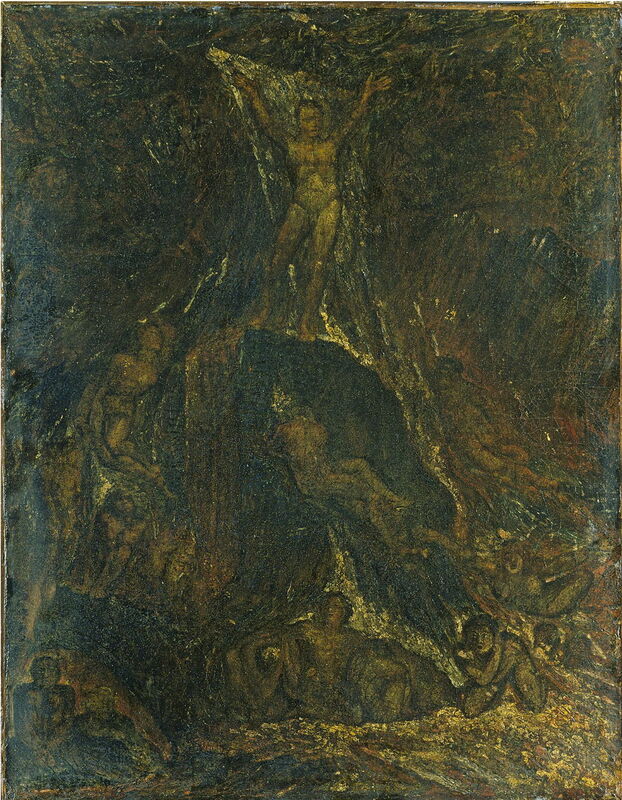 William Blake (1757–1827), Satan Calling Up His Legions (c 1809), tempera on canvas, 54.5 x 42 cm, Victoria and Albert Museum (Gift of the Executors of the late W. Graham Robertson through The Art Fund), London. Image courtesy of and © Victoria and Albert Museum, London. The version of Satan Calling Up His Legions (c 1809) now in the Tate in London is that dubbed by Blake “an experiment picture”, and has not aged at all well. 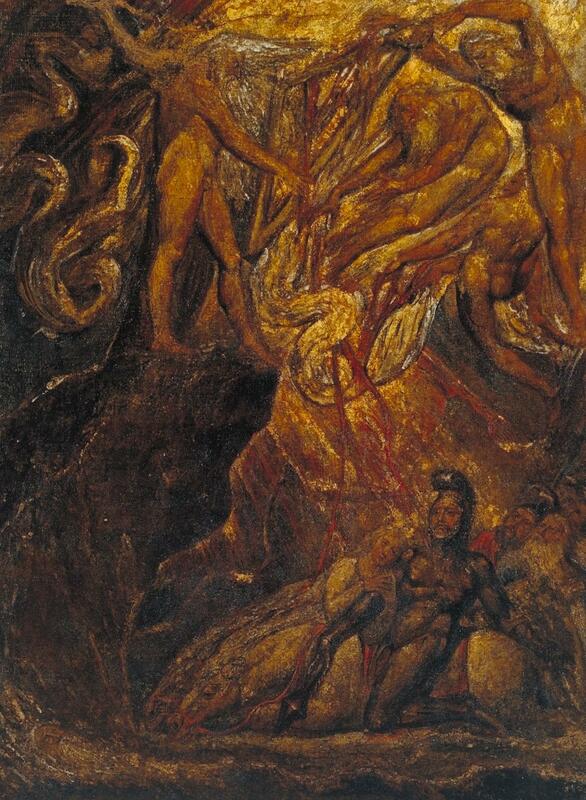 William Blake (1757–1827), Satan Calling up His Legions (from John Milton’s ‘Paradise Lost’) (c 1805-09), tempera on canvas, 53.5 x 40.5 cm, Petworth House and Park (National Trust), Petworth, Sussex, England. The Athenaeum. The other version, Satan Calling up His Legions (from John Milton’s ‘Paradise Lost’) (c 1805-09) currently at Petworth, is almost identical in its content, and much more readable still. Satan stands and addresses the fallen angels, calling on them to join the forces of darkness. 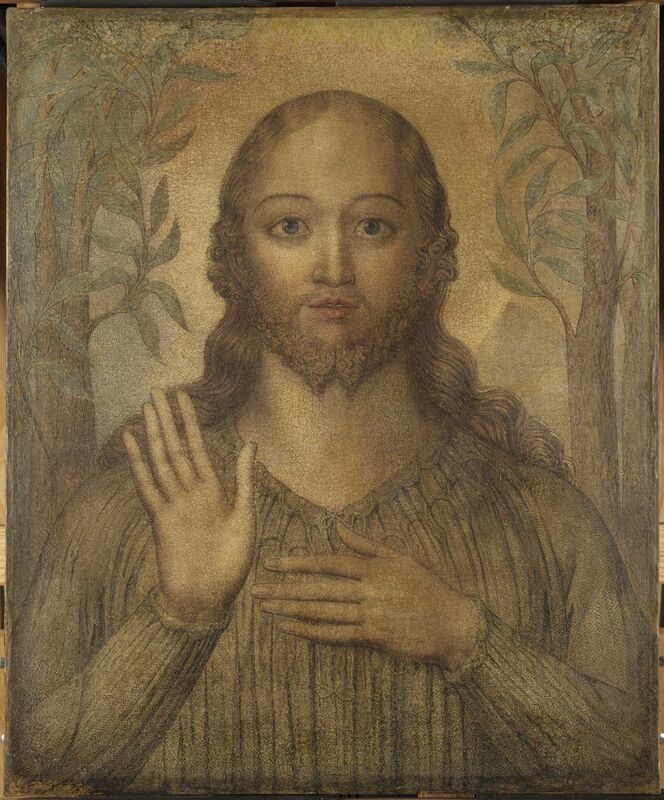 A decade after Blake’s series of fifty tempera paintings on biblical subjects, he completed four more for the same patron, Thomas Butts. Each is a relatively large portrait of a key figure in Christian belief, set against the background which keys in their respective story. Adam Naming the Beasts (1810) refers to Genesis chapter 2, verses 19-20, and is unusual in that Adam is caressing a serpent with his left hand, although this event takes place before the creation of Eve, let alone the Fall of Man. William Blake (1757–1827), Eve Naming the Birds (c 1810), pen and tempera on canvas, 73 x 61.5 cm, Pollok House, Glasgow, Scotland. The Athenaeum. 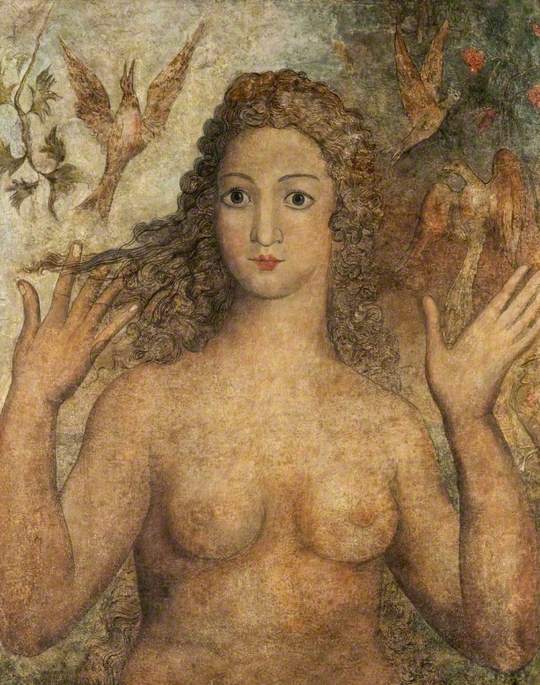 Although its companion, Eve Naming the Birds (c 1810), looks to be in similar condition, much of what you see here is overpainting from attempts at restoration, rather than Blake’s original work. While forming a pair with his painting of Adam (above), according to Genesis Adam named the birds before Eve had been created. 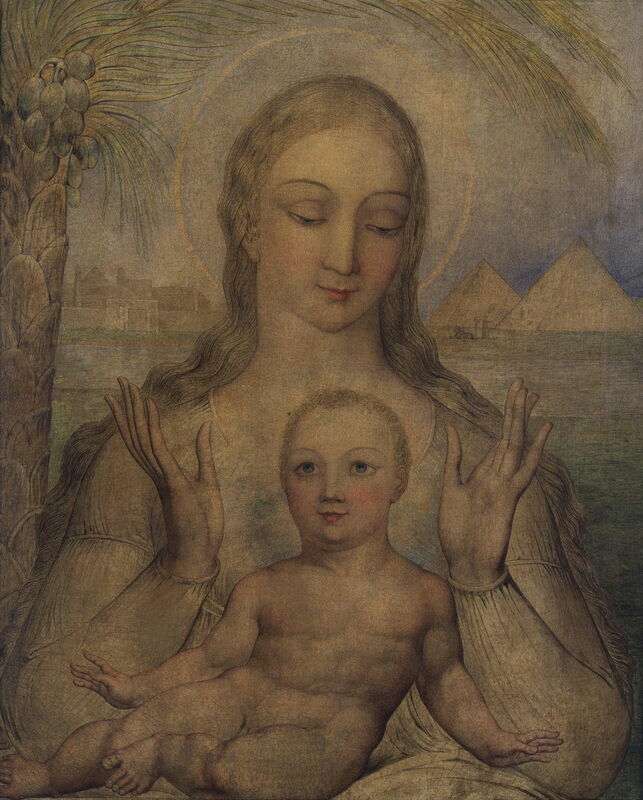 William Blake (1757–1827), The Virgin and Child in Egypt (1810), tempera on canvas, 30 x 25 cm, Victoria and Albert Museum (Given by Paul Mellon), London. Image courtesy of and © Victoria and Albert Museum, London. The Virgin and Child in Egypt (1810) refers to the gospel of Matthew, chapter 2, verses 14-15, and shows the Virgin Mary and infant Jesus when they were in Egypt. The background shows Blake’s imagined view of the pyramids, and a tiny sphinx, together with the River Nile and the city of Cairo. Christ Blessing (c 1810) completes the series, with an image of Christ giving his blessing before his crucifixion, there being no stigmata. Bindman D (1977) Blake as an Artist, Phaidon Press. 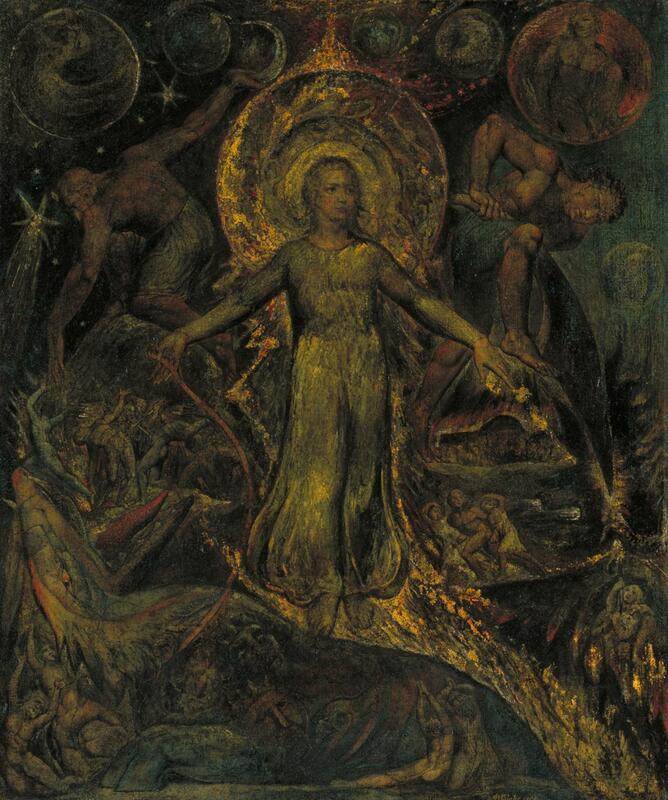 ISBN 0 7148 1637 X.
Hamlyn R & Phillips M (2000) William Blake, Tate Publishing. ISBN 978 1 8543 7314 4. Townsend, J (ed)(2003) William Blake, the Painter at Work, Tate Publishing. ISBN 978 1 8543 7468 4. Posted in General, Painting and tagged Blake, painting, tempera. Bookmark the permalink. macOS Sierra and Dropbox: have the problems resolved yet?